(0 Customer Reviews) | Write Review 4 issues per year A Needle Pulling Thread® is a quarterly magazine that encompasses a wide variety of needlework in every issue: quilting, knitting, cross stitch, embroidery, crochet, beading, rug hooking, fibre art, sewing, and more. It includes projects with full instructions and stunning photography, as well as informative articles on trends and techniques, and needlework show reviews. Each issue is 100 pages or more in full colour. Install this app and get a FREE Sample Issue! 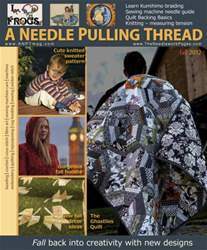 A Needle Pulling Thread® is a quarterly magazine that encompasses a wide variety of needlework in every issue: quilting, knitting, cross stitch, embroidery, crochet, beading, rug hooking, fibre art, sewing, and more. It includes projects with full instructions and stunning photography, as well as informative articles on trends and techniques, and needlework show reviews. Each issue is 100 pages or more in full colour. Install this app and get a FREE Sample Issue! You'll receive 4 issues during a 1 year A Needle Pulling Thread magazine subscription. You'll receive 4 issues during a 1 year A Needle Pulling Thread magazine print subscription.